I always find people's flight stories boring. "We were headed for Kansas City but then there were tornadoes there so they re-routed us to Chicago" yada yada. Until they happen to me. Oh my. Then they're like juicy gossip and everyone ought to sit there with their mouths in a perfect O, listening and exclaiming. O'Hare is a dirty, humid, busy airport. At one place there were these big tall white columns like airports have, but the top half of them was taken away for some reason, revealing that they were actually just white decorative tubes around a bunch of pipes and wires. . .and these pipes and wires looked rusty, crusty, caked with awful things, and downright dangerous, like they were going to crumble away any minute now. Meanwhile in the restrooms they had these cool new inventions, the only redeeming factor at O'Hare--there was this tube of clear plastic around the U of the toilet seat. You wave your hand in front of the little green light, and ZZEEEEEEP! the germy tube gets sucked into one end of the U while pulling behind it a clean section. But trust me, don't go to O'Hare just to see this, because the toilet flushes on its own with great ferocity every thirty seconds as well, a frightening experience. Oh yeah, my schedule and stuff. So there were thunderstorms around the Midwest and more and more flights were being delayed. And after two delays they said our flight to Charlotte was cancelled. What a sick feeling. Everyone else scampered to the desks to change their tickets and I followed with a heavy heart, meanwhile calling Paul and Amy to pray for me. And of all the miraculous answers, the airline lady was able to send me on a flight to Greenville, and Greenville is way closer to Amy than Charlotte anyway, and Amy was already in Greenville with her friend Esther. And then it was a small plane, three seats wide, my favorite, so I was a happy traveller again. So Amy the dear daughter picked me up (but not my suitcase because it got sent to Charlotte )and we talked with great speed all the way to Due West and Erskine College where the convention is, and I have completely fallen in love with this campus. It's like something out of Anne of Green Gables going to Queens. We're staying in the women's dorms, a 3 story white brick building with a large porch on the front with southern rocking chairs here and there, and inside are high ceilings and tall windows and elegant furniture and a parlor and a sitting room and two wide white open staircases turning upward, and you can just see Gilbert nervously waiting on one of the elegant settees while the matron watches with an eagle eye and Anne comes dreamily down the stairs in her new taffeta gown and he gives her a box with flowers and she pins them on and they walk across the Quad to the cotillion. Yes, well. This is what's actually on my mind: I took Emily in for a blood draw a couple of weeks ago to be re-tested for food allergies like she was 6 years ago, and found out mere hours before I left that they couldn't do the test because her white blood cells were dying off way faster than white blood cells ought to die off. Now does that sound ominous or what? I managed to get hold of the doctor before I left, and he tried to keep me from freaking out, but said yes it's cause for concern and we need to look into it a lot further. Best case: someone made a mistake with the blood draw. Worst case: some horrible form of leukemia or a blood disorder. In between: something to do with West Nile. Something fixable that will restore her to good health. Who knows, maybe she'll be the textbook case, helping the medical world discover the link between WNF and idiolymphocyticatrophy. (I made up that word). So today I was on the plane and the woman next to me was a wise and Godly grandmother whose son is dying of cancer. So I told her about Emily because I knew she'd understand. And she re-affirmed that prayer is the key to all of us getting through this and was so nice and just what I needed that of course I started crying, which is what I do whenever someone truly empathizes. Speaking of which, a number of very kind and well-meaning people have hinted/suggested/implied/insisted that Emily's health issues are due to emotional/spiritual issues. And if she would talk more about things/quit reading fairy tales/confess hidden sins/expose some unknown past abuse/get counselling/get treated for anxiety then she would get better. I find this very difficult, for two reasons: 1) I am easily intimidated, and 2) all of my instincts as a mom tell me she has something specific wrong with her physically, and while I know she has plenty of character issues to work on, none of these conjectures resonate with my spirit as being true. I am not saying she doesn't have emotional issues. But goodness, who of us doesn't at 17 or 18. And we don't go around analysing Emily's friends her age and getting them to probe as deep as they can to see if there isn't maybe something down there, do we? Even if they listen to bad music or flirt shamelessly or seem sad and withdrawn, somehow we let them grow up and deal with things on their own timetable, because they're healthy. Ok, I'm annoyed and frustrated and tired, did you guess? And worried. I also think we American Mennonites don't have a box for anything vague and chronic. Cancer we can handle, or a broken leg. But bring on slow fevers and fatigue and we start analysing and conjecturing and implying and blaming. I would love to be vindicated by a specific diagnosis that would explain everything. But I would way rather just have her get well, vindication or no. And if I'm wrong and it's emotionally based, I'd happily be proved wrong if it made her well. Meanwhile, I cling to my sister's words: "Dorcas, trust your instincts. Fight for your daughter. As a mom, you know if there's something wrong. Don't give up." "Just go on your trip and don't worry. You can pray, but don't worry." Ben is a nice kid who calls me when he's going to be working late so I don't worry. He's also the one who asks if there's anything I need carried to the van on Sunday mornings. He sacrifices for his siblings and climbs seed sack stacks with Jenny and sleeps on the trampoline with her. And if I need any numbers crunched, Ben does it in his mind far faster than I could locate a calculator and do it myself. He loves God and thinks about things. Ben has survived a lot and I'm very glad he's alive and well today. Emily made this place setting, crown, etc, for "King Ben." 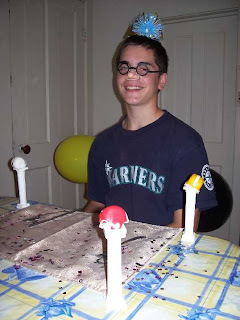 Ben chose root beer floats instead of cake and ice cream. 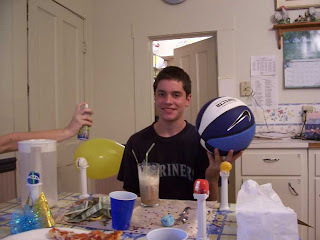 Here he is with his gifts including a dangerous-looking can of Silly String. Me (measuring carefully): I think you're. . .hmmm. . .about 5 feet 7 1/2 or 5-7 3/4. Ben: Let's just say 5-8. Plans are to fly to South Carolina this weekend, speak at the Biblical Mennonite Alliance convention on Saturday, and then Amy and I drive her car home, all 2833.3 miles. Amy is in Jamaica at the moment with her old SC youth group. My speech is 95% done so I'm not worried about that. And I've planned our route and have it all printed off Microsoft Streets and Trips. And most of my clothes are packed. Now I just need to make copious lists and menus so when I come home the garden is still alive and the potted plants aren't brittle and brown and the animals aren't hungry or thirsty and neither are the people and the younger ones remember to go to Vacation Bible School. And I have one more big assignment to finish: my column for August. But first I have to decide what to write about. c) my two universes and how odd it feels to step back and forth between the two. Universe A: muddy garden sandals, trying to talk to young people who keep interrupting, noise and dirt and dishes, "Wow, Mom, you have a lot of gray hair!" Universe B: shoes with heels that click, speaking to tasteful ladies who listen with rapt attention, quiet voices and decorated tables and coffee brought to me, "Ooooooh, you look far too young to have six children!" Ok, I can't think what the redeeming point would be for any of those, so if any of you fine and supportive readers have tips for me, or ways to extract a point from any of the above, or completely different ideas, please comment. "We have a hippie group here. 5 of us." I had heard that there is a whole sub-genre of books and movies out there that is specifically by and for Mormons. Then recently at a garage sale I picked up a novel called "What the Doctor Ordered" and entered this interesting sub-culture. The story was pure fluff--college student goes to stay with old aunt who is determined to match her up with cute doctor, she is equally determined not to get matched up with cute doctor, yada yada. What I found most interesting was the way the Mormon practices and terms were casually woven in with no explanation for tourists like me--ward suppers, high priests, sacraments, home teachers, and so on. I didn't catch any whiffs of proselytizing, no conversions carefully or clumsily constructed to show me how it's done. The only obvious plug was the doctor telling the pregnant girl exactly which 800 number to call for support. As I recall, Clara Bernice Miller decided to write Katie with this same taken-for-granted attitude toward the Amish, with no sidebars explaining covering strings and dates after the singing. I think I like that. So when my Mennonite novel comes out, roughly in 15 years judging from how fast it's coming together, don't expect belabored explanations of acapella singing, head coverings, CLP Sunday school quarterlies, the church covenant, and canoeing or hiking in skirts. "I can't wait til Friday." --Zack the longsuffering nephew, listening to Emily and Jenny talking in weird accents. Zack goes home for the weekends, you see. I got to thinking. . .would there be any way to verify just how cold it was the night the van burned up? I always estimate it was 20 degrees below zero Fahrenheit and Paul always says 15 below. So I got on the computer and in about 5 minutes had found a detailed weather chart for January 16, 1994. The accident happened about 20 miles south of Dryden, which wasn't on the chart, but Kenora, about 80 miles west, and Sioux Lookout, maybe 50 miles northeast, were both listed. At 10:00 that night in Kenora the temperature was -15.88 degrees Fahrenheit and the wind chill was -38.2. In Sioux Lookout the temperature was -13.9 F and the wind chill was -32.8. So Paul obviously was closer to the technical mark but any way you look at it, it was cold. And I think it's cool how you can look up stuff like this on the internet. My friend Ilva suggested I tell about how we went back to the accident site four years later. We were living in Oregon then and visited our old haunts on a long road trip. As we headed up that same isolated road on a summer evening we tried to look for landmarks to figure out just where the van had been. Finally Paul thought he had found the spot and we got out and looked around. And there in the grass we found charred coins that had come from my purse and a blackened key chain with the faint "I (heart) Paul" still visible. So with our very alive and healthy children we held hands and thanked God for sparing our lives at that place. Three years later we went up there again and on that same road we saw, but didn't hit, 11 moose, one of them standing majestically in the middle of the road not far from our accident site. It all gave us a strange feeling that that dark, cold night we had been part of a bigger story going on, perhaps caught in the crossfire of a battle in the heavenlies, that we only saw the immediate, visible results of, and what was meant to happen, happened, and what wasn't meant to, did not. The story of the key chain was that after Paul and I had started dating and I had very mixed emotions about it all, my wise friend Marilyn bought me this key chain that stated blatantly that I loved Paul. Shocking. My blunt friend Mary said, Well, is it true? And I said, "I don't know." After a while, though, I did know. And I was happy to find that key chain again. I started getting excited when I saw the ketchup!" --Ben, telling me how he came home from work and first realized we were having hot dogs for lunch, as opposed to something boring like roast beef and potatoes. While We're At It: The Official Van & Moose Story. . .
. . .as first published in the Register-Guard in 2001 and then in Ordinary Days. We notice here that I am posting a lot, a sure sign that I have three major deadlines in 9 days: a column to write, a speech to prepare, and a trip to leave on. It's so much easier to get inspired to blog-post when there are enormously more important things to work on. Yesterday was an ordinary day. I brushed and braided my daughters’ hair and drove the children to school, then stopped in to visit an elderly friend. After school, Amy, our 12-year-old, checked out an 18-inch stack of books from the library in Harrisburg. Second-grader Ben emptied the mousetraps and earned a quarter toward his next Lego set. Paul, my husband, figured out his taxes. Jenny, our busy toddler, unrolled 6 yards of toilet paper and dumped Cheerios on the floor. I helped 10-year-old Emily with her homework and wondered if she will ever quit making her a’s look like o’s. Matt, the tall teenager, poked me in the ribs to hear me shriek. That night, I snuggled next to my sleeping husband and listened to an owl hooting across the creek. And I kept a promise I made seven years ago. We lived in Canada then, near a Mennonite-run camp for Native American children and families, a hundred miles north of the Minnesota/Ontario border. With our four young children, we had traveled to Oregon for Christmas. On this particular night, January 16, 1994, we were on our way home and had only 25 miles to go. We were all tired of traveling and eager to get home after our 4000-mile journey. Behind our van, we pulled the trailer that was to carry our belongings when we moved back to Oregon the following summer. It was 10:30 at night and bitterly cold, probably 20 degrees below zero, with a light snow falling. The isolation of this hundred-mile stretch of road was unnerving enough in broad daylight, but at night it was almost hauntingly empty. We passed a gas station at the forty-mile mark; otherwise there was nothing but rocks, lakes, and trees. The last vehicle we had seen was a car we met just after we crossed the border almost two hours before. Paul was driving, and the children slept. We felt safe and cozy, close together in the warm van, pushing a round ball of light ahead of us through the darkness and the falling snow, mile after mile. I saw it first, a shape appearing out of the darkness. A young bull moose trotted down the middle of the road ahead of us, hemmed in by guard rails on both sides. Paul stepped on the brakes and the van slipped and swerved on the snowy road. But we were unable to stop and we hit the moose with a gentle thump, like bumping your grocery cart into the one ahead of you at Safeway. The van lurched and slid but stayed on the road. Paul eased the van on down the road a few hundred yards, where the guardrail ended and he could pull off the road. We checked to make sure everyone was ok, and Paul got out to inspect the van. "It’s not damaged that badly," he said when he came inside. "We hit it by the headlight, and the fan might be pushed in a little bit, but I’m going to leave the engine running to keep it warm in here. I think I’ll go back and make sure that moose is off the road. Watch this gauge here, and if it starts to get hot, turn the engine off." He pulled on his fur hat and mitts, and left. I sat in the driver’s seat to watch the gauge, feeling calm and unafraid. Paul would soon be back and he would get us all home safely. After a while, I smelled something hot, just a whiff. I checked the gauge; it was fine. "I’m going to look in the engine," I told the children, who were now awake. When I peered under the hood, nothing seemed abnormal. I walked on around to the passenger-side door of the van, opened it, and froze in shock and horror as I saw little flames shooting out of the dashboard. I couldn’t think or move. Then, like a slide coming into focus on a screen, I was able to think one clear thought at a time. "Fire. This van is on fire." "I’ve got to put it out." I grabbed a sports bottle of milk by my feet and squeezed it at the fire. Nothing happened, but I inhaled black smoke that burned all the way down. A new thought: "I’ve got to get my children out." Three-year-old Emily appeared in front of me, and I carried her out and waded through the snow to set her on the trailer behind the van. Another thought, another child. I lifted out Amy, age 5, then Matthew, seven. Another slide appeared on the screen in my mind. My baby. I reached through the billowing, burning smoke and unbuckled 5-month-old Benjamin’s car seat. I pulled him toward me, grabbed his blankets, and waded back to set him on the trailer with the others. As I did, I heard my children screaming: terrible, terrified screams that were swallowed up by the endless night and cold. And I realized I was alone, all alone with these helpless children in a world of malevolent horror, blackness and flames. Paul was gone and we were the only people left in the world. Another thought penetrated my dazed mind: "It’s cold. I’ve got to keep my children warm." I yanked open the back door of the van. There on top was the big suitcase with their boots, ski pants, and extra wraps. That morning it had been heavy and bulky. Now, I pulled it out and tossed it far down into the ditch as though it was a basketball. Then, with mindless determination, I dug for the extra blankets that I knew were in there somewhere. The flames were almost to the back seat, but I hardly noticed. I had to get the blankets or my children would freeze. A voice called me; a breathless, rasping voice. "Dorcas, run!" I couldn’t run. I hadn’t reached the blankets yet. Paul appeared close to me. "It’s going to explode! Get Benjy! WE’VE GOT TO RUN!" Oh, yes—that gas tank under the back seat. I had forgotten. I grabbed Benjamin in his carseat, Paul carried Emily, and with Matthew and Amy we started running, into the night, away from the van. For the first time, I actually felt the cold. I looked down and saw my shoes, sweater, and skirt. "I’m going to freeze to death," I thought calmly, and kept running. Suddenly, out of the endless darkness around us, lights appeared. They were real. Headlights. What vast, glorious relief to see a pickup truck pull up beside us and a man jump out. He welcomed us into the truck and set the children into the wide space behind the seat. Ahead of us, the moose struggled to lift his head from the highway. Behind us, orange flames leaped from every window of the van. And in the warmth and safety, I counted our children, over and over and over. The next evening, while Paul answered calls from friends and relatives, I sat on the living room floor and read to the children. I could think clearly again, and felt the full horror of our experience wash over me, again and again. At the same time, I was overwhelmed with a sense of gratitude and wonder: we were all there. All of us. Together, whole, warm, safe, and alive. It was the first time I really sensed how close we walk to death, and I had a new awareness of the preciousness of the people I love. Too often, I realized, I had taken my family for granted and complained that my life wasn’t exciting. Now I began to understand that even the most ordinary moments are treasures, priceless and fragile. So I promised myself that I would never lose that sense of wonder or complain that my life wasn’t exciting enough. And last night, lying in bed and listening to the owl, I kept my promise and thanked God for the incredible gift of an ordinary day. Since you asked: The Official Bambam Story. . .
. . . that I wrote probably ten years ago in Verda Glick's writer's workshop by mail, and never sent off to CLP like I intended. Funny how much editing I think it needs now. Some years ago, feeling out of touch with the needs of the world, I prayed for opportunities to minister to others. What I wanted was desperate women at my kitchen table asking, "What must I do to be saved?" as their cups of tea grew cold. Instead, God placed us in an isolated Indian village in Canada, and he surrounded me with children. Dozens of them. They came storming into my life with noisy boots and runny noses. They tracked snow and sand indoors, coughed wretchedly in the baby's face, and taught my son dirty words. Without knocking, they burst into our house at all housr, even late in the evening when my husband was putting the children to bed. They came in with bloody noses that I was supposed to treat, and once a table full of special guests from civilization was treated to the view of Marcel's hockey-smashed nose in the middle of supper. Just as I was about to tell God that this was not exactly what I had in mind, he sent me Bambam. I believe his given name was Jules, but everyone called him Bambam, and he did his best to bam-bam my hard-won Christian virtues to oblivion. Bambam was only about five years old, but his capacity for sheer wickedness was developed to a fine art. He threw our children's boots onto the roof, sand into their eyes, and their toys into the lake. In summer he wouldn't share swings; in winter he hogged the sleds. He pitched dirty water on the windows I had just washed. He always managed to blast into the front door just when I had put the baby to sleep. "Aay! Smucker!! Cook-EE!!" he would shout in that peculiar Cree accent, as the baby wailed in the bedroom, clouds of frigid mist rolled across the floor, and I yelled at him to shut the door. Since Bambam ignored everything less exciting than what he saw on TV at home, including all my lectures, I had no hope of ever having an influence on his life. But it slowly dawned on me that perhaps he was supposed to have an influence on mine. One day I had drained the wringer washer, as usual, via a hose strung down the hall, through the living room, and outside. I unhooked the hose and pushed the washer back into the corner. 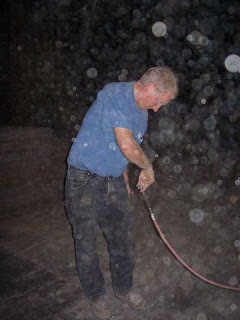 When I turned around to gather up the hose, I saw a river of muddy water spreading over the floor. I found Bambam outside gleefully pouring dirty water in the outside end of the hose. "Lord!" I yelped silently, "What are you trying to teach me through this child??" There was no answer. Then there was the raspberry episode. We seldom had fresh fruit, so I was delighted one summer to find wild raspberries growing around the village. I gathered my children one afternoon, handed out little containers, and set out to pick enough raspberries to make a pie. We had barely started down the road when who should join us but Bambam. I couldn't justify sending him home, so he tagged along. I had a sinking feeling that he would find a way to spoil the venture for us. Sure enough, at every clump of bushes he delightedly dived in ahead of me and picked and ate the very fattest berries before I could get to them. I was ready to scream. Again I prayed a silent, exasperated prayer. "God!! WHAT do you want me to learn from this child??!" As I stood there with my container of berries I got an answer. It was as though God gently pushed aside my frustration and poured the healing balm of his Word. "Suffer the little children to come unto me, and forbid them not." "Inasmuch as ye have done it unto one of the least of these my brethren, ye have done it unto me." "Whoso receiveth one of these little ones in my name receiveth me." I walked home with few berries but a measure of peace. Apparently Bambam was supposed to teach me to love. So I loved him. Not with my emotions, but with my will. I probably didn't treat him that much differently than before, but there was a new purpose in it. I talked gently when I wanted to scream. I made him sit, glowering, on a kitchen chair when I would have loved to whack him. I let him spend hours at our house when I longed to send him packing. I had long since given up on having an influence on Bambam's life. God was teaching me plenty, and that was enough. Then came the hallelujah party. The churches in the village didn't want their members celebrating Halloween, so they offered an alternative--a time of games and good food, but no masks or costumes, at the community hall. We bundled up the children and walked over to join in the fun. It seemed like the whole village had turned out. After all, who could resist the spectacle of plump, 45-year-old David and Mary Kanakakeesic running a relay race with a balloon held between their heads? But my laughter evaporated when I looked around and saw that Bambam was also there and, oh no, he was coming my way. I steeled myself for trouble of some kind. Bambam walked over to us and in a complete reversal of behavior put his arm around me and announced with a big smile, "MY BEST FRIEND!" At first I was too stunned at this unbelievable turn of events to respond, but I finally managed to give him a big smile and a hug in return. It dawned on me that God was no doubt watching, also with a big smile. In his own mysterious way, he had fulfilled my desire to touch a needy life. Do you ever have a completely random something from your past drop into your present? I was cashiering at the rummage sale in the church fellowship hall on Saturday when the church phone rang. I answered, and a loud, enthusiastic, accented voice said, "This is Ulf Oldenburg from Germany! Can I speak to Brother Smucker?" I nearly fell over as the dots suddenly connected in my head. When I was a child at our little Beachy-Amish church in Minnesota, Ulf Oldenburg used to come and preach to us about the persecuted church in Eastern Europe and Russia. He had that intense been-through-the-fire look in his eyes, and would preach until ten at night sometimes, through a patient interpreter. I remember he wouldn't spare on the details despite the children in the audience, and once described a Christian man who was tortured by putting "Zwei Hoge in sei Nass" (two hooks in his nose) and hoisted up. I thought Ulf was an old man back then, and I can hardly believe he's still alive thirty years later. But apparently is he not only alive and well, but he's learned to speak English quite well. He'll be in this area sometime soon I think. I'll need to go hear him. Home from the evening service. Zach the nephew came in the door not long ago, dropped off by Uncle James and Aunt Orpha who brought him down from Hubbard. Emily is at a friend's house. Paul is reading to the younger ones--The Incredible Journey at the moment. Popcorn and grape juice are being consumed, and Amy is probably in Jamaica by now, having left yesterday to go to South Carolina and join her youth group from last year on a mission trip. The school fundraiser garage sale was yesterday. We made some money but please don't ask me if it was worthwhile for at least another week, if then. It turned out to be at least 3 times bigger than I had expected, and I was piling used clothing on tables in my dreams. I learned that garage sales are "mom" things and not a good school project, and if you ask teenage guys to put the t-shirts here and the sweatshirts over there, they are somehow unable to do this, or to distinguish either of them from sweaters, and they don't have the slightest clue how much a sandwich maker or used candle should cost. I will say that they are great at putting up signs and hauling boxes, but not at the finer things. By last night I was so tired I couldn't see straight, and then I went to bed and woke up at 4:00 this morning and couldn't go back to sleep. I am like a two-year-old when it comes to the importance of a good night's sleep, so I found myself crying for no reason other than sheer utter tiredness in the middle of Sunday school. This was embarrassing. Thankfully lunch was in two crock pots and afterwards my nice husband cleaned up and I slept for several hours and oh how much more pleasant the world looks. Emily went to church today, both services, start to finish, for the first time in about ten months. Glory and praise. She also helped me with the children's meeting this evening, mostly by giving me ideas for stories to tell and assuring me this was just as good as a clever craft or a story from a flip-book. "You were famous in your day for Bambam stories," she said, referring to the little neighbor guy in Weagamow Lake in Canada who used to come over and hog the swings, throw dirty water on my windows, and lots of other terrible things. So I told stories, of my childhood and Bambam and my children, and by special request, the story of when we hit a moose and the van burned up. * And all the kids listened except the few who were poking each other in the corners. And then they got a double dose because by a strange coincidence Paul referred to the same episode in his sermon as an illustration for praising God for his deliverance. I've noticed that when Paul tells this story it's 5 degrees warmer than when I tell it, and he tells more about the trailer hooked on behind, which is now at the warehouse, and he always brings in something about insurance, which I somehow neglect to mention. *Full story in the last chapter of Ordinary Days. --Steven's explanation of why a cane was poking out his window and scootching around on the porch roof every few minutes the other day. He wanted to warm up his swimming trunks, which he was soon going to get wet in the creek, which of course is toasty warm from mountain-snow runoff and all. Normally my kids roll their eyes when I say, "Woot woot!" because it's so 46-trying-to-act-16. But I think today I can say Woot woot all I want and no one will fuss. You can read Emily's encouraging update here. You may recall that I entered a contest several months ago for a house at the coast. Well, today I read the depressing news in the paper that the owner decided to call off the contest. He had extended the deadline twice but only had about 2100 entries out of the 3000 he hoped for, so we'll all get our money back eventually and he'll go back to trying to sell it. Of course my personal view is that with the housing market what it is, he would have been better off to keep the money that came in, choose a winner, and leave it at that. But he never asked for my advice, an error that so many seem to make. Now what do I do with all my ideas and dreams for this house? It was going to host family get-togethers, and we were going to fix a small apartment for Emily to get well in, and the ladies' retreats and Bible Memory Camps were going to be there, and our friends were going to rent it for weekends at the beach, and I was going to maybe host a few writers' weekends, and returning missionaries were going to stay there to recharge their batteries. And now that little dream seems finished. As you may be aware, none of my old-enough-to children are dating, for a variety of reasons, lack of interest not being one of them. I am wondering how much a mom should be involved in nudging, hinting, choosing, indicating, pointing in the general direction of, and so on. Recently a mom I was talking to said, "You can not control who your children fall in love with!" Well, believe me, I know that already, having been oft informed of the importance of "chemistry" in more ways than not mixing chlorine with toilet bowl cleaner. But I also know that some heavy approval or disapproval on Paul's or my part could tip the balance one way or the other once things actually had a bit of momentum. Matt says that guys have a "list" that includes every girl they know that they would consider a possibility. It doesn't take Barbie-doll looks or phenomenal talents to be on this list, I have gathered, just a general niceness, self-respect, Christian faith, and good grooming, which is surprisingly important, and a bit of zip and zing, as my Aunt Vina used to say. However, a sharp tongue can get you erased off the list pretty quickly, as can selfishness and excessive neediness. The girls have lists also, I think, but are not as free as Matt is to tell me who is on them and what qualities are most important. Confession time: As a mom, I have a few lists of my own, and when I meet a young man or woman I sometimes add them to my list and sometimes I even say a few prayers alerting God to their excellent potential. This is the problem: the people on these lists keep pairing off with people who are not my children. It is very annoying. Is it so much to ask that half a dozen nice young ladies on my list wait till Matt is out of college and has a good job so he can choose among them? I didn't think so, but there they go, picking instead some weaselly young man who isn't nearly as cool or smart as Matt, and posting cozy pictures of the two of them on Xanga, leaning into each other on a creek bank. Then there are all the guys on my list who haven't noticed Amy yet, or tasted her exquisite cinnamon rolls, and while I am in no hurry to marry her off, and I want her to taste boldly of life before she "settles down" as the Amish say, it seems they could have the decency to at least stay available until she's ready, but noooo, off they go, pairing up with some harebrained little thing with a hank of hair dangling down beside her nose, in the requisite picture of the two of them on Xanga. You will notice here that I am being very vague and not mentioning names, because I will be in enough trouble as it is when my kids read this. And they are going to accuse me of being a matchmaking Mennonite mom, but here at least I think I have the trump card, because I spoke at a Presbyterian church a while back, and mentioned to the women that among lots of other things going wrong that week, the girl at the top of my list for Matt had started dating someone else. And afterwards several women said they empathized so well with this, and one of them told me, almost in tears, that there was this nice neighbor girl who was so sweet and talented and pretty, and she ran in track, and she worked hard on the farm, and this lady so wanted her for her son, and now she's dating someone else. She looked heartbroken, telling me, and we had a real mom-to-mom sympathy moment there, believe me. So it's not just a Mennonite thing. It's fun having grown-up children, but it's not easy. JoNell the nephew's wife and I are looking at an ad for the new Kit movie. Me, to JoNell: Were you into American Girls? Matt, interrupting: I've been into American girls since I was 14. Mrs. 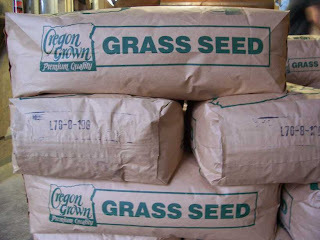 I's comment on the harvest post made me think I should write a detailed post about growing grass seed. 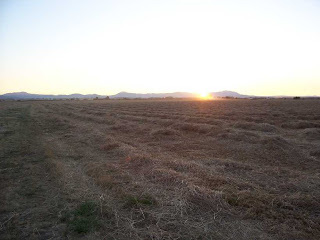 However, I wrote about two sentences in my head and realized I needed Paul's help for the details--do they plant all kinds in the fall or does perennial ryegrass re-seed itself? 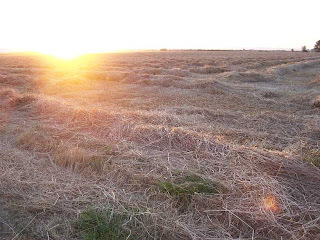 Why is it called "cutting" the grass when in other parts of the country it's called raking or swathing or windrowing? Well they do windrow it but I don't think they say, "Lowell Kropf windrowed his fescue today." The problem with involving Paul is that I see very little of him these days, and when I do see him it's either at the warehouse and he's all in a rush to get the beltivator fixed, or he's eating supper an hour and a half late, or he's collapsed onto the couch, having first taken the time to put an old quilt on the couch to protect it from his dusty clothes, bless him. So I can't bring myself to bother him with refining a blog post. Meanwhile, I'm writing this in a motel at the coast, where all of "us girls" went to celebrate the three birthdays of ours that occur between June 25 and July 6. The beach was very cold and windy last night so we ate at Mo's and window-shopped in Old Town Florence and then returned to the motel to watch a dvd Amy had brought along. "Would anyone rather read than watch a movie?" I asked, since I was deep into a book Aunt Susie had donated for the school rummage sale, They Loved to Laugh. "I would!" said all three girls. So we all sat on the beds and read and a good time was had by all. And then it was time for three young ladies and one old one to settle down for the night, and we will draw the curtain of charity over that scene, and the talking, and giggling, and Jenny's midnight imitation of how her mom sleeps, with a little hissing "poooh" with each breath, and Amy and Emily's gales of laughter., and my feeble, desperate pleas to be quiet. Ah well. Sleep finally came to all. "Mirror mirror, on the wall, I am my mother after all." --a little plaque in one of the little shops, that sent me into fits of giggles, while the girls looked on, mystified. I said they'd understand it in 30 years, and Emily said if she sees it in 30 years and thinks it's funny, she'll think, Mirror mirror on the wall, I have my mother's sense of humor after all. 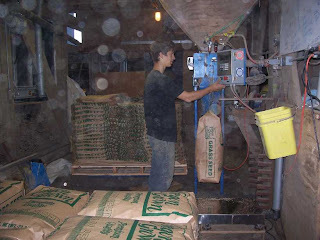 My nephew Zack is staying with us for the summer and sacking seed for eight hours a day. He's still learning about the job and very tired at the end of his shift, but he's catching on fast. 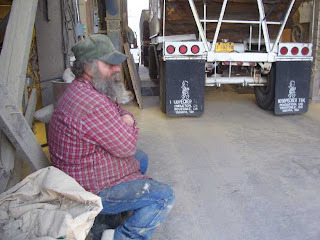 This is Roy, waiting while his truck dumps. He drives for a farmer named Hugh Gray who brings us about half of the seed we process. Paul blows the dust off his clothes before he eats his supper. A client of mine once came to me for her appointment reeling. She had just been at a department store where a young man was looking for a present for his nephew. He stopped her with the sentence, “You look like a mom ... what would you suggest buying for a ten-year-old boy?” She wanted an entirely different haircut that day. Obviously the implication here is that looking like a mom is a bad thing. Maybe that's because the popular perception is that looking like a mom is all physical, and all moms are sloppy and out of shape. At least that's the impression I get when people meet me and insist that I can't possibly have six children, which is flattering in its way, but I think the essence of a real mom shows up on her face and I hope that's what people can see in me. I am proud to be a mom, and I hope people can look at me and tell right off that if they have a problem they can tell me about it, that I've survived enough crises to know what to get upset about and what not to, that I'll happily dispense advice, that I believe in better things for them, that I'll drop everything to make them a cup of hot tea, that I'll happily mother anyone who needs mothering. And if someone stops me in a store to ask what to buy for a ten-year-old, I'll feel honored. "You gotta be the funniest mom alive." --Jenny. Yes, I consider this one of the best compliments ever. Today's Letter from Harrisburg is about change. And today is Emily's 18th birthday. You can visit this amazing daughter of mine here. "Ah can ah-dentifah with thaaat!" --Julia from Mississippi, referring to the story about Ben and Steven picking and spilling the blackberries. She has never met me but reads my blog, and was driving up Interstate 5 the other day while on a Western Trip with her husband and remembered a story about us living by the freeway and called to find out which was our house. We moved out of that house some years ago, so I couldn't wave at her, but we had a nice chat anyway. So yesterday I called the chiropractor's office to see which foot of Matt's needs an insert in the shoe since he's back on his feet, sacking seed, and needs to know and it's been so long that he got out of the habit of using it. So I left a message and, soon after, the phone rang. "Hello, this is 'Elonna'." Oh, ok, must be Elona Ketcham from the Shoppe of Shalom, otherwise known as the Mennonite Store. But she went on, "I'm calling from Dr. Ruckman's office and I got your message, and it's the left foot." She then went on to ask how I was doing and just chitchatted like an old friend. I was thoroughly confused. How many women are there with names pronounced "Elonna"?? But WHAT would Elona K. be doing calling from the doctor's office? To my knowledge the only place she works is the store. But there she was, chatting like she knew me. I don't do well with shifting contexts, like if you'd be in an airport overseas and see your neighbor lady. Wait, is that really her? But it looks just like her. But WHAT would she be doing here? But whoever this woman on the phone was, she was asking me what I'm doing on the Fourth of July. I tried to act nonchalant and normal despite my confusion. "I think I'll have Amy take the kids to the parade and then we'll all go hear the Knox Brothers and watch the fireworks." And she said, "So is it true what I heard, that this is the last year the Knox Brothers are singing at the gazebo, or maybe the second-to-last year, and they're going to be disbanding?" Oh dear, I had heard nothing of the sort. We ended the conversation with me still confused about who I had been speaking to. And at the supper table I broached this very important topic: Were the Knox Brothers disbanding? I found this alarming, feeling like I had never appreciated them as I ought, or gone to their concerts (besides the 4th of July ones), the way we Oregon people don't go to Crater Lake. No one knew. "Ask Grandma, she'll know," someone said, but if she didn't know it could just fan the flames of rumor even more. Wait, you don't know who the Knox Brothers are? Shocking. Ok, they are these six brothers who grew up in this very house and their mom was Paul's grandpa's half sister. They have been singing together for many years and if you knew what you ought to know about Gospel music, you would know who the Knox Brothers are. Especially if you're over 40. Half of them live just down the road from us, and every year they sing in the gazebo on the riverfront in Harrisburg on July 4th while we all wait for the fireworks, which is a lovely summer ritual. This evening I sat by EG who knows everything about Gospel music. " Are the Knox Brothers disbanding?" I asked. "No!" she said emphatically. "There's this crazy rumor out there because they're not doing the one Gospel music festival any more, and next month there's a big 40th anniversary celebration for them. But they're still singing like they always have and there's no sign of them quitting." What a relief. I really need to actually take in one of their concerts sometime, just in case they actually do retire. And I should go see Crater Lake again sometime, just in case they drain it or something. And now you know that that rumor isn't true. "Excuses, excuses, you hear them every day. . . "
--a song the Knox Brothers sang this evening, by special request, for someone's 11th anniversary. Not sure we want to know the reason this was requested. If you've heard me speak in the past year you might remember me saying, "You have a story to tell." It's a theme I keep coming back to and trying to convince women of. Apparently someone at the AARP has been thinking along the same lines because they just published this article called "Everyone has a story to tell." It's one of the best how-to's on memoir-writing I've ever read. Thanks to Margaret from the First Congregational Church for the link. I don't yet get AARP literature myself, just so you know. "Services are Christ-centered, liturgical, and dignified." Another theory shot down: I was sure there was something in Oregon that Emily is allergic to--maybe molds or ryegrass dust or lilac pollen. We got her latest test results back and everything Pacific North West was negative, plus everything else they tested her for. Except West Nile fever. That's still elevated, the nurse said. As I understood it, it will keep showing up on tests long after Emily's well, so not much can be concluded from this except that the original tests were accurate and we have actually been dealing with West Nile for the last 10 months and have not been wandering down a dead-end tunnel in this maze all this time. Today it's two years that my nephew Leonard ended his life, and of course the whole family is remembering the generous, fun person Leonard was and reliving that awful, awful week. And yet. His sister Janet is in Haiti on a mission project. Annette and her husband took flowers to neighbors who lost a son to a motorcycle accident. And Marcus, who is my brother and Leonard's dad, has consented to lead a workshop on suicide at Penn Valley Retreat Center this fall even though it's going to be very difficult for him. "Well, you make choices every day of your life, and the easy choice would not be to do the redemptive thing." --Annette. But as you can see they choose to do the redemptive thing anyhow.